Anyway, the figs tasted just as good when I had explicit permission from the fig tree (bush?) owner to take some. 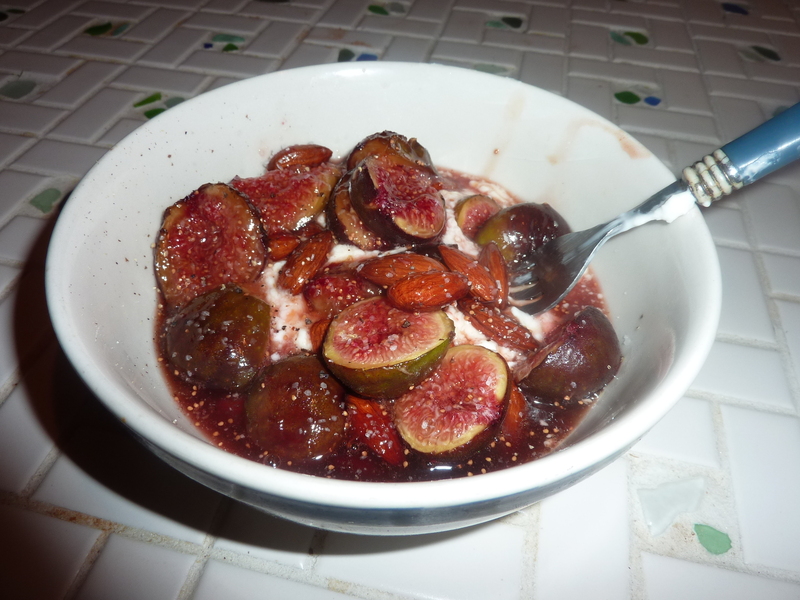 As a special treat, I wanted to make something that really showcased the delicate sweetness and vibrant flavor of the figs, and this preparation fit that bill to a tee. This picture does not do this beautiful dish justice (as is so often the case on this blog). This time, it was because I wanted to devour it that very second and figured two pictures were good enough. Oh well. Served over some plain Greek yogurt, these figs made up a healthy, delicious, and surprisingly filling breakfast. They would also make an excellent dessert served atop some vanilla ice cream. Make sure not to skip the salt and pepper at the end – it really makes the sweetness of the figs shine. The balsamic adds a bit of a tart bite and rounds the whole thing out. Mix together honey and balsamic vinegar in a small saucepan. Heat over low heat until a syrup forms, whisking frequently, about 4 minutes. Add almonds. Toss figs with honey and balsamic mixture. Place on a tinfoil lined baking sheet, cut sides up. Bake 10-12 minutes until beginning to brown. Season liberally with kosher salt and freshly cracked black pepper. 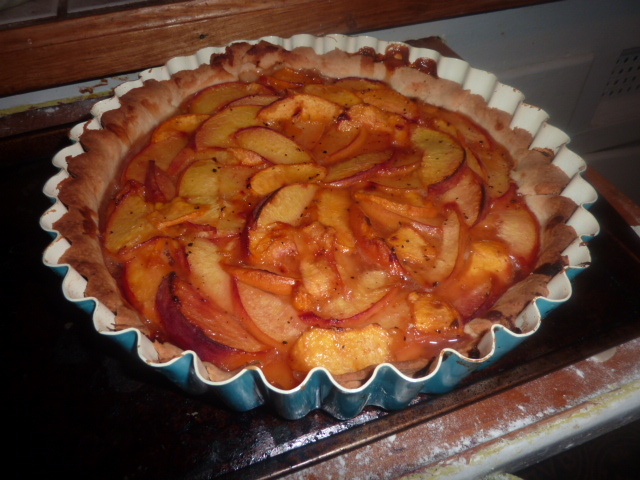 Though I’m not usually much for baking, an abundance of peaches from our CSA prompted me to bust out the tart pan for a sweet rather than savory application. I’m very glad I did, because this tart was absolutely delicious. The pastry was crumbly, butter-y, and sweet and the peaches were perfectly caramelized with a hint of vanilla. I loved the slight bite of the freshly cracked black pepper. Although I’m no dessert expert, I thought this was a real home run. It was also basically foolproof. If you can pulse a food processor and work a rolling pin, you can make this easy, flavor-packed explosion of peachy goodness. Place flour, salt, and sugar in a food processor. Pulse in 1 second bursts 5-10 times until combined. Add the butter a piece at a time while pulsing until the mixture resembles a coarse meal. With the food processor running, slowly drizzle in the water a bit at a time until the dough forms a ball and just comes together. Try to minimize the processing as much as possible. Turn the pastry onto a lightly floured cutting board and form into a ball. Cover loosely with plastic wrap and chill in refrigerator about an hour. Working on your floured cutting board, roll out the pastry into about a 14″ circle. Spray a tart pan with non-stick cooking spray. Drape pastry over the tart pan. Place in refrigerator while preparing peach filling (see below). In a large bowl, combine peaches, sugar, honey, and vanilla extract. Let sit about an hour, chilled. Arrange peaches in the pastry however you please. As you can see, I did a spiral pattern, but you could just as easily dump ’em in and spread them into an even layer. Bake 40-50 minutes until crust and peaches are browned. Let sit about ten minutes before cutting. When we asked what I could contribute to Zak’s family Thanksgiving, I was told I could bring a dessert. We all know I am not a dessert person. However, I figured it couldn’t be that hard, and I wanted to contribute. I’ve never worked with puff pastry before because I always found it intimidating, but it turns out it’s actually really easy to work with. I’m glad I bought an extra package, because I have a few ideas of how I would like to use puff pastry again in the near future. Anyway, this dessert was easy, pretty, and tasty. I prepared it the evening before Thanksgiving and served it chilled and everyone who tried it seemed to enjoy it (or maybe they were just being nice, but I liked the few bites I had). Cream butter and sugar with a hand mixer. Add egg and French vanilla extract and blend with hand mixer until smooth. Add almond meal and flour and beat until a smooth past is formed. Cover and cool in refrigerator. Roll out puff pastry until 1/4″ inch thick, if necessary. Trim edges if necessary to make even. Layer sheets over one another with about 1″ overlapping. Using a sharp knife, score a 1/2″ border along edges of puff pastry (this allows the sides to rise above the rest of the pastry). Prick the center all over with a fork. Brush the borders with egg yolk. Cover a baking sheet with tinfoil and spray with nonstick cooking spray (or line with parchment paper). Top scored area with frangipane. Layer fruit slices over the top, alternating between apples and pears. Brush lightly with melted butter. Bake for 30 minutes until golden and puffy. 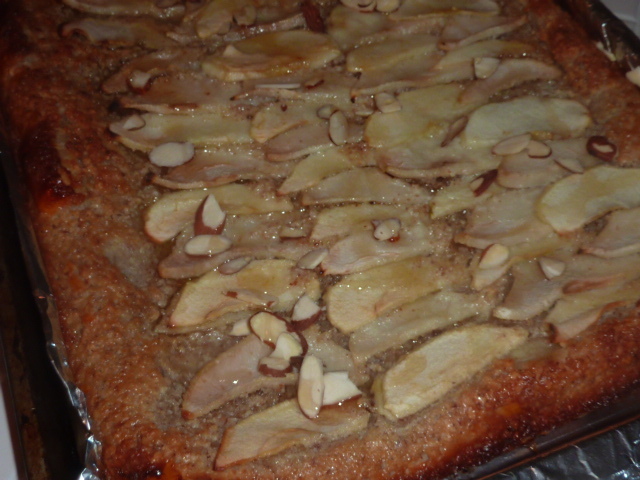 Drizzle with honey and sprinkle with almonds.